Dual-speed motor allows the platen to quickly return just above the bottle instead of moving all the way home. VERSATILE Technology has released the AED119 top load tester for providing top load (peak force) testing of plastic containers. 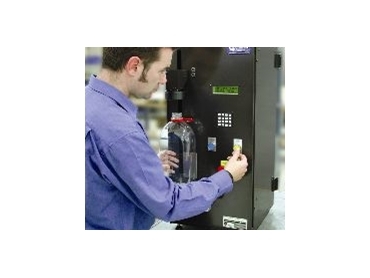 The gauge has automatic bottle height memory and fast bottle find and return. A heavy-duty, dual-speed motor allows the platen to quickly return just above the bottle instead of moving all the way home, greatly reducing cycle time.) Operators' simply load the empty bottle and press the start button. Full scale of the unit is 100kg and accepts bottle heights of up to 350mm. Data output via the built-in RS232 port is accepted by all SPC applications. The gauge is extremely low maintenance and has built-in calibration and diagnostic routines. Serviceability is excellent. Service centres in the UK, USA and Australia provide worldwide support, calibration and maintenance services.